I have a personal collection of Poole Pottery and I have several fairly comprehensive galleries of pottery dating from the early 1920s through the 1970s. There is plenty of printed reference material available for Poole including price guides and decorators marks. Poole Pottery is generally always well marked. 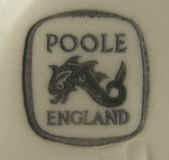 I’ve only ever seen one pot which looked like Poole but didn’t carry a factory mark on the base. and the decorators mark, which are sometimes initials but just as often a symbol. The earliest factory marks on Poole date to the beginning of the 20th Century and bear the company name of ‘Carter & Co’ or just Carter’s. 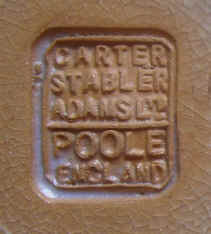 Later marks reflect the change in the company name, becoming Carter, Stabler & Adams; Carter, Stabler & Adams Ltd; and eventually Poole Pottery. A few of my Poole Pots are for sale but you can also find a good varied selection of Poole Pottery for sale on ebay.